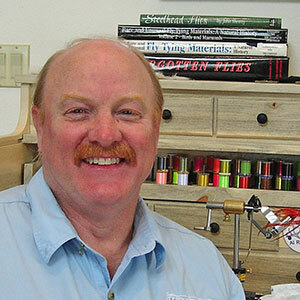 Marshall Cutchin: Al Ritt is a fly-tying instructor, demonstration fly tier and owner with his wife Diana of Al Ritt Flies. 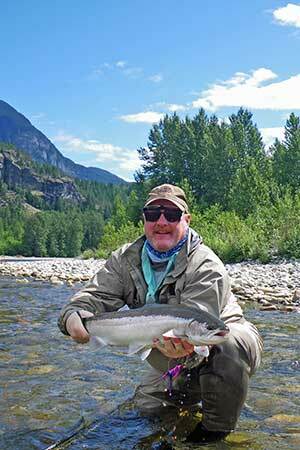 He’s also the brand manager of PEAK Fishing, a manufacturer of premium-quality fly-tying devices and bamboo rod-making planing forms and tools. 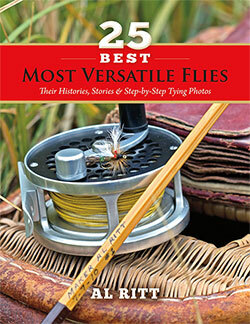 His brand new book–which happens to be his first, by the way–is called 25 Best Most Versatile Flies, Their Histories, Stories and Step-by-Step Tying Photos. It’s a book for intermediate to advanced tiers, and it gives not just the steps for tying each pattern but also the entertaining history behind many of tying’s most classic patterns. Welcome, Al. Al Ritt: Hello. How are you? MC: Good. Glad the wind stopped blowing? MC: That’s one of the things you live with if you live on the Front Range of Colorado, right? MC: Tell me, how did you get started in fly tying? AR: I’ve always had some kind of innate interest in it. 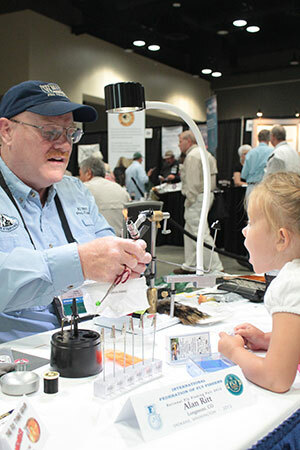 I don’t really know where that came from, but even as a kid, 9, 10 years old, I can remember bugging my parents about getting me a fly tying kit, although they didn’t fly fish, and I didn’t really fly fish at that young of an age, but I was just fascinated with flies. I remember sitting at the kitchen table without a kit and taking bread tie wrappers and pipe cleaners and bending up my own hooks and making up materials out of those and trying to form little flies out of those. Finally, they got me a starter kit. My grandmother had some experience as a contract tier for a little while in Northern Michigan. She helped me a little bit with my first couple flies, and I enjoyed that, but, like I say, I was not an avid fly fisherman at the time. Later on, after I graduated college, I moved to California and saw my very first fly shop ever. Walked in there and ran immediately home and got permission to sign up for a fly tying class. Before I was even really seriously fly fishing, I was entered in a class, and just everything built on itself from there. It’s just gotten better and better. MC: When did you start doing show demonstrations and exhibitions? When did you feel like you were qualified to begin teaching? AR: I’d taught lessons as long ago as the late 1980s. I did my first demos probably around 2000. Let’s see. Is that right? Maybe around 1998, 1999. I did work at a fly shop around the year 2000 and taught fly tying lessons there. From there, I just started expanding on the demos, and I got the job here with PEAK, which gave me the opportunity to travel around quite a bit, be a little bit more involved in the industry, and a lot more opportunities to do demos. The lessons have come along with that, more classes, more lessons at the same time. MC: Sure. How do you think the hobby or the art, if you will, of tying has changed in the three decades you’ve been doing it? AR: This starts, I guess, a little bit before I actually started doing it, but within my lifetime it wasn’t easy to find a lot of information if you wanted to start tying flies. A lot of guys were very secretive about it. There weren’t a lot of books out. At one point in time, it was not uncommon for people to buy a fly and nick the head with a X-Acto blade and unwrap the fly, take the materials off the hook, save those materials, and write down the steps in reverse order. Then using the same materials and thread try to recreate the fly that they’d just taken apart. Now we’ve got untold numbers of videos on the Internet, classes at every fly shop, people helping people out at demos and things like that. People are just so free with the information now. I think just the availability of information is, by far, the biggest change. MC: Your book is not really a book for new fly tiers, although I think new fly tiers can gain a lot from it because the introductions and the histories of flies. I personally found those the most fascinating part of the book, not that the details aren’t also excellent for the steps. Was that your intention was really focus on the background for the patterns? What else did you have in mind when you put the book together? AR: Well, it is a fly tying book, so I felt it was very important to have good, clear instructions with good photography, so that you could go in and tie the patterns and try and learn some techniques. It was not my intent to go in and write a technical manual on getting started on tying flies. It doesn’t show you how to start your thread on the hook or how to tie a whip-finish knot, but if you can do those things you can probably pick up the book, go through the steps, and tie most of those flies in there. I wanted it to have a little bit more, for maybe lack of a better term, entertainment value. It was important to me that it had some content that was enjoyable to read. For me, that’s where the history, the development of the flies, how to use them, that’s where that content was really critical. That’s what I wanted right from the get-go was to have a book that had a little bit more written content and not just a technical manual. MC: A couple of chapters in your book tell the stories of patterns that were created simultaneously or from the same new material that just sort of appeared on the scene. It reminded me of a term in biology—I think they call it “convergent evolution,” where you’ve got two different things going on, or in two different places the same thing is happening. Do you think that’s the exception, or is that more common than people think? AR: I think there’s actually very limited number of things we can actually do as fly tiers. We’ve got materials, thread and a hook. All we’re really ever doing is binding materials to the hook with the thread, so you’re holding material up there against your hook, and you’re wrapping your thread in a circle. It limits, to some extent, what can possibly be done. The other thing is we’re all trying to imitate the same food sources, so our flies, in the end, all want to have some similar characteristics. When you’re using similar techniques to try and create a similar effect, I think it’s inevitable that you’re going to find a lot of instances where there’s things that are very similar, if not identical, that are developed completely independent of either party knowing that that’s going on. It may not even be at the same time. You see a lot of stuff come around, and if you’ve seen some of the older flies, patterns, techniques, you’ll see something pop up in a magazine as the newest, hottest thing. A lot of times you’ll notice that that bears a very strong resemblance to [a pattern], if [it’s] not just a straight-out, identical technique, or a fly is something you’ve seen long ago in the past. Maybe it’s fallen by the wayside and been forgotten a little bit, and all of a sudden it comes back to the surface again. I think it happens both at the same time and also in a cycle, but it’s because we’re trying to accomplish such similar things. MC: Yeah, but it’s ironic, though. It’s almost like you need a few decades to forget that something has been created. There’s certainly nothing wrong with having an idea, then rediscovering something that’s been around for a long time. That adds to the interest. AR: If it was an effective fly or technique 20 years ago, and it’s something that’s just faded a little bit, really there is a service in rekindling that and bringing it back to the forefront so it doesn’t disappear. AR: That’s certainly a contribution, even if it’s an accidental contribution. It’s still a contribution. MC: Do you think that people actually “invent” flies? 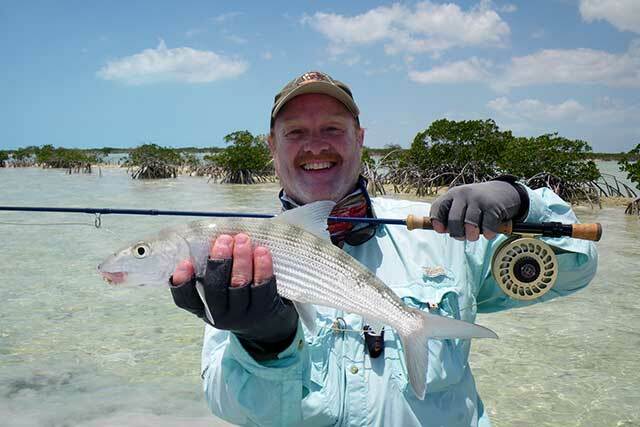 I’ve struggled with this concept myself for a long time because, in the world of fly tying, both commercial and noncommercial, there is occasionally a situation where a fly appears to be something brand new. It really is debatable whether the elements or, in fact, the pattern itself is brand new, or because it was created or not known by the tier perhaps it deserves a new name. What do you think about the concept of fly invention? AR: You know—and if I’m not interpreting the question quite correctly, go ahead and correct me—but I think maybe, in addition to invention, we’re also maybe talking about naming or possibly even claiming fly patterns. That’s a hard question because there’s a lot of different scenarios there. There’s certainly a lot of creativity, and people do come up with things that are slightly unique. Maybe they’ve taken several different concepts that have been used but combined them in a different way, or a new material comes available that allows somebody to do something a little bit different than has been done in the past. That certainly happens. You have instances where just accidentally people develop something very similar, and they both come up with a different name for it. There’s a lot of competition now with the signature tiers. There is some temptation, probably, in certain limited cases, where things get borrowed and used, but it’s not that lucrative a business, being a signature tier. I don’t think it’s quite as intense as some industrial secrets, but you have to name a fly in order for people to be able to identify it. That’s the other side of the coin. You say, “Well, is it right to name a fly after yourself or name this fly because you’ve changed one thing in it?” What it comes down to is you have to give it some kind of name so people can identify and know what it is you’re talking about. MC: Sure, and I appreciate your very subtle use of the initials ARF in a couple of the patterns that, in fact, you’re author of. I realize, too, there’s quite a bit of serendipity, as you say—the need for a new pattern or a new material that appears on the scene or the use of the new material. In fact, I think you told me recently how a rotten container-load of rabbit’s feet shut down an entire type of tying for a year. AR: It put a serious crimp in it, that’s for sure. AR: Very first part of February. I think it hit the shelf February 6. MC: If you haven’t seen it, it’s really worth picking up. It has a wonderful lay-flat binding, and tons of detail in there, besides the step-by-step tying photographs, which Al took himself. He’s really got some interesting background in all these patterns. Thank you again, Al, for your time, and I hope to go fishing with you one day soon. AR: That’d be awesome. Thank you for the call and for having a conversation. I enjoyed it. I would absolutely love to sit down with you and maybe throw some flies together or throw some in the water.